Cruciferous vegetables such as broccoli, kale, cabbage, cauliflower and garden cress, all help in fighting cancer by mitigating the effects of environmental carcinogens. However, broccoli is the most powerful of all the cruciferous family of vegetables with its excellent anti-oxidant properties. It’s heartening to note that we can get all the benefits of this natural cancer-fighting super food by eating just a small amount of broccoli sprouts, which are even more intense in chemo-preventive benefits towards getting healthier and can possibly reverse, suppress and possibly prevent the development of cancer. The sulforaphane, works as a catalyst to enhance detoxification enzymes in the body, triggers ongoing antioxidant action and boosts the effectiveness of vitamins like C, E and beta carotene. These processes build body’s immunity and improve liver’s ability to detoxify environmental pollutants, carcinogens and other toxins. This helps in substantially reducing the incidence, rate of development and size of tumours. In studies, consumption of broccoli sprouts has shown a significant decrease in a biomarker for DNA damage, which strongly suggests that it enhances cleansing of cancer-causing substances from your body. Indoles and isothiocyanates have been found to inhibit the development of cancer in several organs in rats and mice, including the bladder, breast, colon, liver, lung, and stomach (1,2). In a study in Japan, it has been shown that broccoli sprouts, if eaten regularly can significantly reduce Helicobacteri pylori (H. pylori) infection, which causes a lot of gastric problems and may contribute to peptic ulcer and even stomach cancer. Another set of studies suggest that broccoli sprouts help preventing and treating breast cancer by stimulating production of 13C (indole-3-carbinol), a substance known for its ability to fight cancer cells’ proliferation by targeting cancer stem cells i.e. the small number of cells that fuel a tumour’s growth. This helps in seizing the spread of breast cancer. Researchers believe that 13C can be beneficial in fighting other cancers and can even reverse Alzheimer’s disease. Sulforaphane also inhibits breast cancer stem cells and prevents new tumours from growing. Research shows that a substance called isothiocyanate in the broccoli sprouts sparks hundreds of genetic changes, which activates some genes that fight cancer and switch off others that fuel tumors. Isothiocyanate have been found helpful in reducing the risk of prostate and lung cancer. Though, you can get broccoli sprouts from your grocery store but to get the best of nutritional and protective benefits you need to grow your own sprouts, as in past, few outbreaks of salmonella and E. coli food poisoning were traced to a few lots of raw sprouts. Scientists explain that sprouts often get contaminated during the seeding process by runoff water from animal production facilities, poorly balanced manure fertilizer, or unsanitary seed harvesting. Broccoli sprouts extract has been found effective in protecting against oral cancer. However, people who are cured of head and neck cancer are found at high risk for developing a fatal second cancer in their mouth or throat. Research shows that sulforaphane-rich broccoli sprouts are beneficial in killing the stem cells that make cancer immortal and bring protective changes in the oral lining, where these second cancer are formed. First, buy seeds for sprouting that are either approved by International Sprout Growers Association (ISGA) or USDA certified organic. Then find a glass container with large mouth, some cheesecloth and a few strong rubber bands. Place around 3 tablespoons of sprouting seeds with three times the amount of purified water into the jar and gently shake the jar to soak up all the seeds. Place the cheesecloth over the mouth and secure it with a rubber band. Allow the seeds to soak for six to twelve hours, then drain them thoroughly and rinse. Leave the jar on its side and away from direct sunlight. Repeat this process till sprouts appear. You can also grow broccoli seeds using commercial sprouting kits with trays. When broccoli sprouts are ready to eat, enjoy the protective benefits by using a handful of raw sprouts as a topping or edible garnishes for any salad, soup and savoury pancake. Also try adding them in the spreads, sandwiches, wraps and pasta dishes.Remember to refrigerate the remaining batch of sprouts. To get the maximum benefits you also need to make sure that the broccoli you eat has live enzyme called myrosinase, which is required to form sulforaphane. Avoid overcooking i.e. cooking for too long or at too high heat, as it destroys the myrosinase. Even just 2 minutes in a microwave or 7 minutes of steaming is enough to destroy myrosinase. 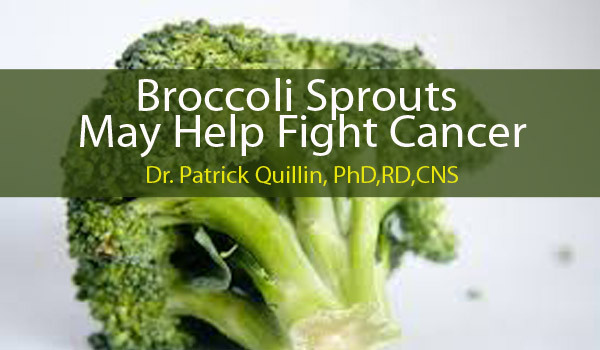 Eating a handful of broccoli sprouts per day is all you need to help prevent cancer but if you are fighting an existing cancer, you need a therapeutic dosage. For that you need to consider blending broccoli sprouts into green smoothies or juicing them. However, to cut its peculiar flavour, you need to add other vegetables and fruits like carrot, apple, celery, cucumber or tomato and make a mixed vegetable fruit juice. So, start adding a small amount of broccoli sprouts in your daily diet as a feasible and tasty alternative to get all the chemo-preventive benefits you get by eating pounds of broccoli. (1) Hecht SS. Inhibition of carcinogenesis by isothiocyanates. Drug Metabolism Reviews2000;32(3-4):395-411. (2) Murillo G, Mehta RG. Cruciferous vegetables and cancer prevention. Nutrition and Cancer 2001;41(1-2):17-28.